This cold food and beverage model reflects the icy cold majesty of the mountains. Use on its own, or add it as a second OMG trailer! At 8 feet long and only 620 pounds, a Rockies can be pulled by most vehicles with a tow bar. Easily hand-maneuver it into a single parking space or through a disaster recovery situation. The hitch can be removed for both security and safety. 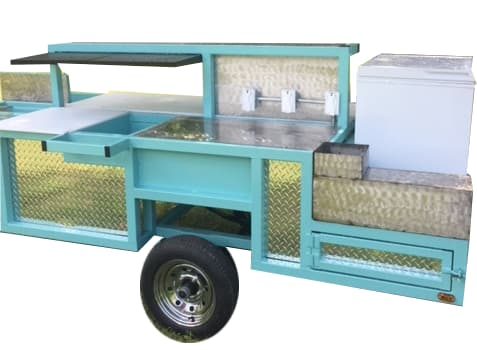 At only $4,500, you won’t find a similar price on a full-featured mobile cold food and beverage kitchen. And with our lease-to-own program, we’re providing the opportunity for anyone to open a business, feed the hungry, or connect with the community. One person can serve hundreds of people in a day, making it easy to take shifts. Whether used in disaster recovery situations, to feed the homeless, or to make a profit, an OMG connects you to your patrons face-to-face. Each mobile food trailer is hand-built from the ground up in Azle, Texas. We only use high-grade steel from trusted suppliers and our welding is performed by expert craftsmen. The attached poly-resin cutting boards are easy to clean and perfect for prep. Eight individual AC wall plugs, and three GFI plugs with six outlets. Keep it clean with the included stainless steel sink, which drains into the 8-gallon gray water tank. Showcase your icy goods in the 40″ display ice well. Two additional ice wells hold a variety of hotel-sized pans.